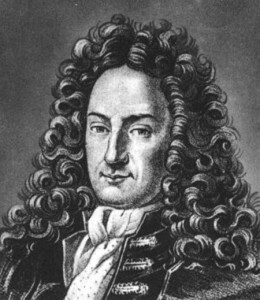 Leibniz refused a professorship in law at the University of Altdorf and instead began his career as a statesman (one of his goals was to reunify the Roman Catholic and Protestant churches). While on a diplomatic mission to Paris in 1672 he met the mathematician CHRISTIAAN HUYGENS and began to explore mathematics. In 1673 another mission took him to London where he was elected a foreign member of the Royal Society for his calculating machine. BLAISE PASCAL had made an adding machine in 1642 that made carrying of tens automatic. Leibniz’s invention was able to add, subtract, multiply, and divide based on a binary instead of a decimal system. In 1675 Leibniz worked out much of the detail for both differential and integral calculus, developing systematic rules and formulas, and he connected the two with the fundamental theorem of calculus. In England, ISAAC NEWTON claimed that he had already invented calculus. Each criticized the other’s work and there was a nationalistic disagreement on who had invented the calculus first. Since Leibniz published first, in 1684, custom would credit him, but the remarkable fact is that Newton and Leibniz each independently created the calculus at roughly the same time. Although Leibniz continued to work in mathematics, most of the remaining 40 years of his life was devoted to philosophy. From 1685 on he was the historian and genealogist for the House of Brunswick in Germany, making the case supporting his employer’s claim to the throne of England in 1714 as King George I. Leibniz died in Hanover, Germany, on November 14, 1716, at the age of 70. Although he contributed to many fields, Leibniz’s primary legacy is his work in mathematics, particularly his invention of differential and integral calculus and promotion of symbolic logic. Leibniz was a prominent advocate of the binary system to speed calculations. Because of his recognition of the simplicity of using only one and zero as symbols to express all numbers, and given his philosophical concept of reducing all ideas to an artificial but universal language of symbols, like algebraic symbols, Leibniz has been called the Patron Saint of Cybernetics. Modern computers are tangible derivatives of his ideas. The controversy over who invented the calculus arose because of the time elapsed between Leibniz’s and Newton’s claims and the dates of publication. Leibniz published first; Newton had shown his work to selected mathematicians as early as 1665 but didn’t publish his ideas until 1704 in Optiks. Both Leibniz’s notation style and his analytical methods were easier to understand and develop. Newton’s technique of fluxions (derivatives) was described in symbols like x with a dot over it to indicate rate of change of some variable. Leibniz described the same relationship as dx/dt where dx is the tiny part of x that changes during a tiny increment of time, dt. In complex equations the descriptive notation by Leibniz suggested relationships that were hidden in Newton’s cryptic symbols. Consequently Leibniz’s calculus influenced a wider range of mathematicians and scientists, including the BERNOULLI family, LEONHARD EULER, Luigi Lagrange, and Pierre Laplace.